Click the button below to add the Recycled bombshell elephant pendant necklace from Cambodia to your wish list. This very special necklace is made from recycled bombshells (safely sourced). Since the fall of the Khmer Rouge, the local artisans have been transforming objects of violence into objects of beauty, which gives each pendant or earring a powerful message of peace. There are very few products in the world that have quite such a story to tell. This jewellery embodies how fair trade production goes above and beyond standard manufacturing on so many levels: from empowering the rural poor to recycling materials, to utilising traditional artisan skills and – what this product does best – raising awareness about global issues. 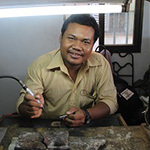 Rajana currently has an application in with the Asian Fair Trade Organisation to become one of only five producers in Cambodia to be Fair Trade accredited, and it is a member of Artisans Association of Cambodia.